This is the stunning photograph that is hanging over my desk providing inspiration for the current story. It’s assembled from a great many individual shots by an absolute genius, photographer Alan Lesheim, and it was taken in the stunning Florentine Valley, in Tasmania. It’s a whopper of a print, and the detail is just boggling (and yes, the Angel is really there, not dropped in). The artist is Allana Beltran, who can often be found performing at the Salamanca markets in Hobart. There is a story behind this as Allana made an amazing and brave stand against the logging of the Weld Valley. There is some incredibly haunting imagery, and this, along with being in the Florentine Valley over the past couple of years, has inspired the new story. Wow, where did that chunk of time go? I’ve actually been terribly busy with a few other creative endeavors. So far this year, the band has taken me to three states in Australia, and overseas to Russia. I won’t bore you with details, as they’re all here in the band blogs. It’s been terribly fun, but also slightly frustrating as at the moment I really want get some writing done. I’ve never really been able to just peck away at a manuscript. I’ve always needed blocks of time so I can submerge myself in what I’m writing. This is great, but it’s not always practical, neither is writing at night, which used to be my staple, but has now become increasing difficult considering that’s when the band works. It’s taken me a long time to get my head around just snatching a paragraph here and there, but I think I’m getting the hang of it, slowly. But what I’m working on at the moment is a little bit different. I’m not sure that there’ll even be any fantasy in it (though it’s early days, and the possibility is very much there). I’m going to change the header of this page in the next day or so to show the piece of art that is currently hanging over my desk, inspiring me. A very dear friend of mine with not much time left looked me in the eyes yesterday as said ‘You know, I think this is Fate.’ She was referring to the turn of events that led to me standing there rather than her dying. I think she’s probably right, after all, if a person in her condition, one of the brightest fires of humanity I’ve ever known reduced to nothing more than the spark can say that, then it might just be true. 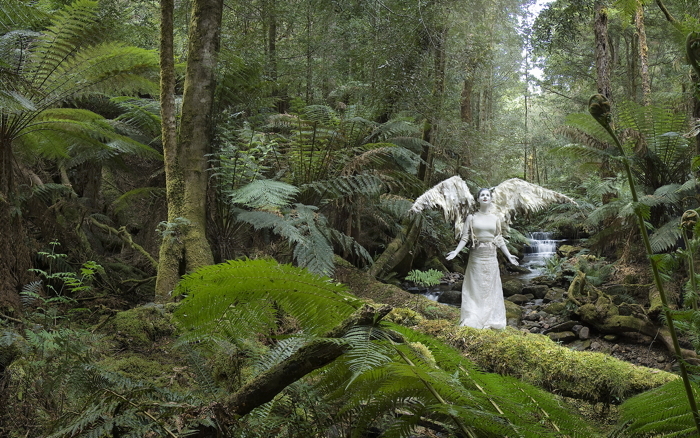 I’m suppossed to be at the Woodford Festival for the next week or so, but instead I’m in Tasmania to be with my friend. The Fate she was referring to is that my current story is set in Tasmania, and that I’d been trying to get down there again this year. It’s another inspiration flash story, a lot like Swim the Moon (in the way the ideas and story were initially formed), and that flash happened last time I was here, as we were driving out to a peaceful protest against logging in the Florentine Valley. I told her about it then, and it was the first thing she asked me about when I arrived. I’ve no idea how long I’ll be down here for. It could be weeks, but somehow I don’t think so. I’ve promised Helen I’ll start the story here, in her beautiful house, and I’ve already spoken to Alan (who took the amazing photo in the blog banner) and we’re heading out back to the Florentine for a bit of off-track rainforest exploring during the quiet times. I don’t think I’ll be in the right headspace to get much writing done, but I made a promise to Helen, and I’ve started, and that’s the important thing. Cracker of a storm today. In true Brisbane style with moments of the rain stopping, the sun was out and the streets were steaming. One thing that struck me was the noise of the birds. I was up in the gardens surrounding the University at St Lucia and the parrots, ducks, crows miners and all the other were going insane. It was as if they were all telling each other they were still alive. With the beautiful pre-sunset light, it was just magic. I’ve been making a lot of notes for this new novel, and I think I’m about ready to start. It’s been occupying a large chunk of my mind (the vacuous bit not consumed with all the upcoming music projects, gadgets or my next meal). Of course, now that I’m ready to start, I have to go away for ten days up to the Woodford festival. Still, I have Evernote on my iPhone, and I might even take my Mac up as this year we’re not performing as Súnas, only as session players. The idea of sitting somewhere shady writing is very appealing! Those are the intentions anyway. The reality when I’m surrounded my musician friends, fiery tunes and Guinness may be somewhat different. I’m not going to reveal much about the new novel, just to say that it’s a bit of a departure for me (though it could loosely be categorised as fantasy) and the format is possibly going to be very important too. I’m not sure if I can pull this off, but then I guess everyone thinks that when starting a new story. Not sure how fast this will progress. I’m planning on blogging pretty frequently, more perhaps as a journal for myself than general entertainment. The music side of life is quietening down for a little bit (in regards to Sunas gigs) but I have a couple of new projects forming there too. 2010 is looking to be very busy indeed!